Here’s one for everybody who responded sympathetically to my Legend of Lead House post. I’d like to say, “It really wasn’t as bad as I made it sound,” but it kinda was. But the outcome was positive, — a safer, nicer home — and I learned a valuable lesson. Home is where the heart is? Maybe. Home is where your family is? Definitely, even if it’s a motel room, a rental house, or a tent. This one’s got a Thanksgiving theme that’s a bit out of place (though Turkey Day will be here before you know it). The sentiments work all year around, however. 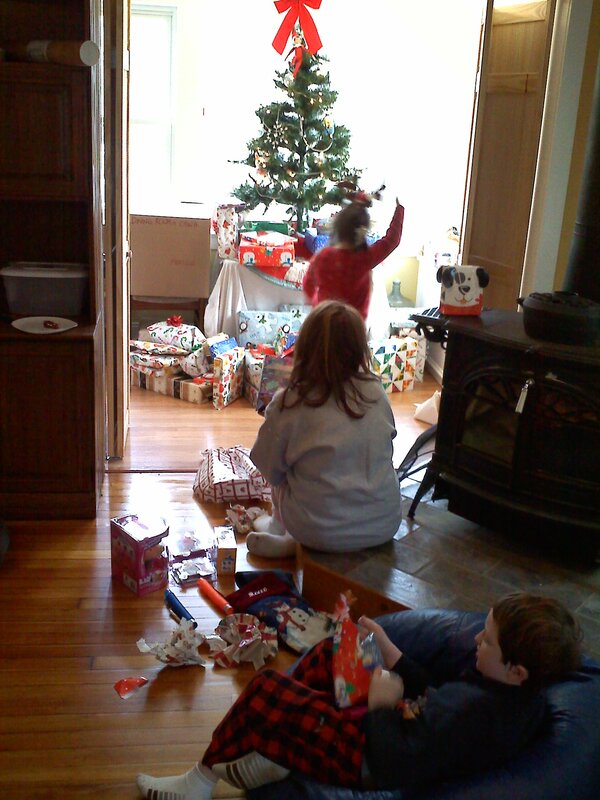 The house was a mess, full of moving boxes, and the tree was small and fake, but we made it home for Christmas in 2010. Thanksgiving is one of my favorite holidays, probably because of the low expectations surrounding it. You’re not required to buy gifts for others or attend a religious observation. It’s a national holiday with a family feel, like the Fourth of July minus the fireworks and with better food. All you have to do Thanksgiving Day is be thankful. Easy as that sounds, it’s a challenge for some. Let’s face it, life is hard. You’ve got a lousy job (if you’re “lucky” enough to have a job in this economy), a crummy house (again, if the bank’s not foreclosing on it) and you live in a dirty, polluted world. (I’m not just talking about BP’s oily mess in the Gulf of Mexico. The worse kind of pollution is pumped directly into your head disguised as “information” and “entertainment.”) Now you have to prepare a big, fancy Thanksgiving dinner for your annoying, unappreciative family. The horror! The horror! Hey, chill out. Life is good! You have lots to be thankful for, even if you don’t realize it. Here’s a quick list of five things you should include in your Thanksgiving prayers. Think of five more on your own by midnight tonight, and the “true meaning” of Thanksgiving will be revealed to you! 1) Family – yes, they aggravate, pester and push your buttons. But they should also inspire, invigorate, and give you a sense of purpose. They’re the reason you are who you are, and why you do what you do, even if you don’t always realize it. Today’s a day to realize it, acknowledge it, and be grateful. 3) Utilities – You only think about them once a month, when you gripe about paying them, but utilities probably play the most unappreciated role in your daily routine. From the electricity running your alarm clock and coffee maker, to the gas or oil heating your home and bath water, to the high-capacity fiber optic lines bringing TV and Internet your home, utilities rock your world. Don’t think so? Turn off all the lights, the TV, and the furnace and enjoy your Thanksgiving feast by candlelight. Guaranteed by the time the pumpkin pie rolls around, you’ll no longer take your utilities for granted. 4) Food – Doesn’t that free supermarket turkey sitting on your table look good? No? Well, it should — more than 850 million people in this world go to bed hungry every night. The World Health Organization estimates that one-third of the world is well fed, one-third is under-fed, and one-third is starving. Two hundred people died from hunger-related causes in the time it took you to read this sentence, and over four million die annually from starvation. Pass the mashed potatoes. 5) Friends – They’re the opposite of the first people on this list, but, as medieval poet Eustache Deschamps noted, “Friends are relatives you make for yourself.” Maybe you won’t see your friends Thanksgiving Day because you’re busy doing “the family thing,” but your friends are some of the most precious and valuable things in your life. As a Nigerian proverb says, “Hold a true friend with both your hands.” Who else would listen to, and laugh at, the stories you tell about your annoying, unappreciative family? 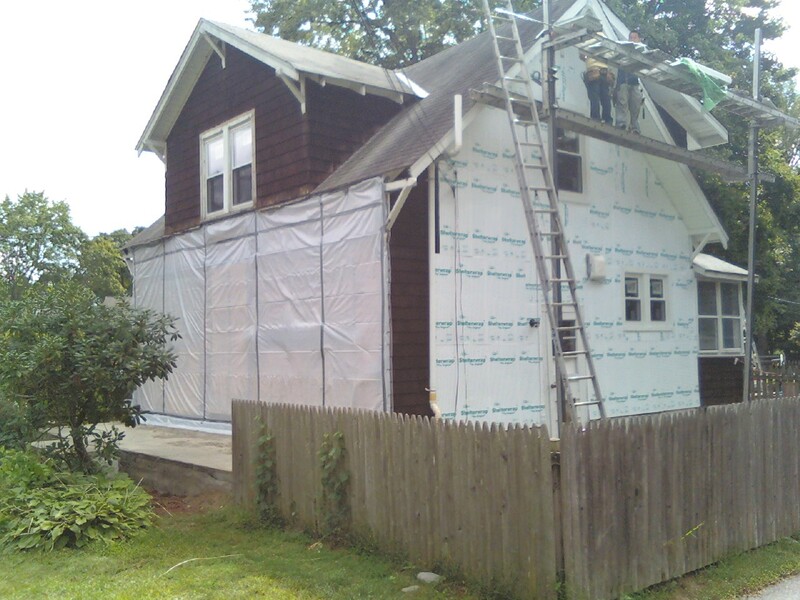 Stripped bare of asbestos siding and crumbling front porch, our home — aka Lead House — gets a facelift. Personally, I have a special affinity for #2 on the list this year. My family and I are staying at my in-laws this Thanksgiving since a six-week home renovation project blew up into a three-month nightmare. We were supposed to be “back home” by the end of September, then by Halloween, then by Thanksgiving…now we’ll be hard pressed to get home before the end of the year. It’s been a stressful time, but it’s taught me some basic lessons. Your “home” is wherever the people you love are, even if it’s a borrowed space. In fact, home isn’t even a place — it’s a person or people. Your house is just that thing with the big mortgage note attached to it. So enjoy your Thanksgiving Day. Remember, you have until midnight to come up with five more things you are grateful for. When your list is complete, hold those happy thoughts dear. You’ll need them to face the Black Friday shopping crowds.